The TRX biceps curl uses suspension cables instead of typical free weights or bands. Performing a biceps curl while suspended challenges your body in conditions of instability. This forces you to constantly engage your core to perform the movement. The exercise not only works your biceps but helps to improve your balance and overall strength. Adjusting the level of difficulty for this exercise is an easy shift of your body position and cable angles. TRX training claims to provide an effective workout with simple equipment. This is one of the many popular reasons people are trying suspension training. The adjustable bands are suitable for the novice exerciser to the advanced athlete and can be modified to fit every fitness level. Many individuals are using this method of exercise to round out an existing exercise program. The TRX biceps curl is an alternative way to build arm and core strength. This classic exercise targets the biceps with shoulders, forearms, and core assisting during the movement. You are effectively challenging biceps during the movement, but also improving muscle strength, stability, and cardiovascular health at the same time. Because TRX involves so many muscle groups for every exercise, it can also benefit your day-to-day life activities. One of the many pros of this method of training is developing a strong core. A stronger core improves posture, helps relieve low back pain, and reduces the risk of injury. This is so important for functional fitness. You not only feel stronger, but you also feel better in general. The great thing about TRX training is portable cables that offer the ability to workout anywhere. It just requires an area where they can be securely attached and you are ready to exercise. Attach cables to an anchor point above your head adjusting the straps to hang down about mid-length. Grab the handles and stand with your body facing the anchor point. Walk your feet toward the anchor point keeping core tight. This places your body slightly leaned back with tension on the cables. Start with elbows bent higher than your shoulders, palms facing you, and handles toward your forehead. Maintain a strong plank position and slowly lower your body back towards the floor until arms are straight. Slowly bend your arms with control and curl yourself towards the handles to start position. 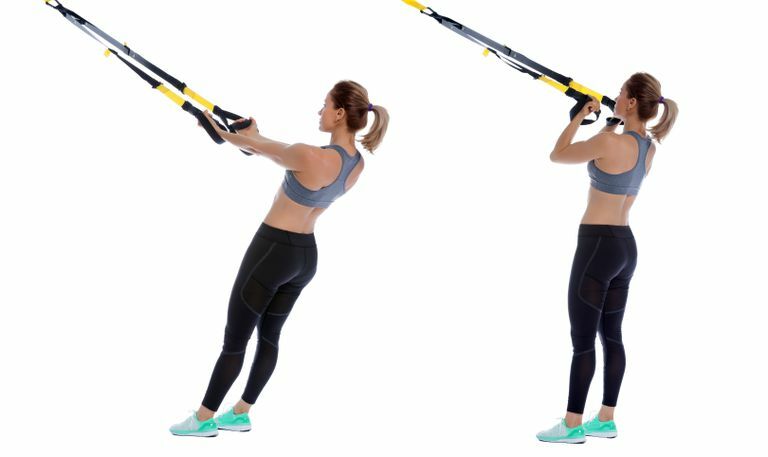 The TRX biceps curl is performed in unstable conditions and special attention is required for proper form and technique. The following are common mistakes to avoid during this exercise. Before starting the TRX biceps curl, perform a body awareness check. Is your core tight, body straight, and angle position good for your fitness level? Avoid the risk of injury by making sure you are set up correctly from the start. One of the biggest mistakes is dropping the elbows to your sides during the TRX biceps curl. This may happen because you’re tired or not staying focused on body position. Think about keeping your elbows up and parallel to the floor at a 90-degree angle and bringing the palms of your hands to the forehead. Otherwise, you’re turning the exercise into a back row instead of working the biceps. Effective TRX exercise requires the suspension straps to remain tight throughout each movement. Having slack in your cables reduces the intensity and effectiveness of the exercise. Be aware of how your straps feel during the TRX biceps curl and adjust for any slack to maintain tension on the cables. The TRX biceps curl can be performed in a variety of ways to accommodate your fitness level. Lengthen the suspension straps allowing you to sit on the floor. Maintain the same tight core and cable tension as you perform the biceps curl with increased stability. Stand with staggered feet position to provide more stability during the movement. Lengthen the suspension straps and walk your feet toward the anchor point. This brings your body position closer to the floor and forces more core engagement while increasing the weight resistance. Balance on one leg as you perform the exercise for increased intensity and core work. Stand with your feet closer together for even more challenge during the exercise. Workouts performed in unstable conditions require even more core engagement during the exercise. Because of this instability, it’s important to be aware of your body position and movement during TRX training. The following tips will reduce the risk of injury during the TRX biceps curl. Be aware of your body position start to finish. Don’t allow your core to sag during the biceps curl. It’s better to stop and take a rest when you feel fatigued than hurt your back not being able to hold good form. Avoid jerky movements during the biceps curl. If the exercise feels too hard, simply modify the movement to your fitness level.